2019 Gold The Yale of Beaufort coins are supplied in brand new, uncirculated condition. The 7th release in The Royal Mint’s Queen’s Beasts Collection is the The Yale of Beaufort. The yale is a mythical beast, able to swivel each of its horns independently so if the leading horn gets damaged in battle, the other horn can swivel around and be a prominent weapon. It descends to The Queen through Henry VII, who inherited it from his mother, Lady Margaret Beaufort, who went on to play a central role in the Wars of the Roses. Her position as matriarch of the Tudor dynasty gave the yale prestige and symbolic meaning. This one ounce gold bullion coin features another original portrait by Royal Mint coin designer Jody Clark. The yale has been portrayed as a creature of regal stature, both rare and magnificent. Its horns, its most prominent feature, is a focal point in the design, maintaining its mystery and ancient heritage. 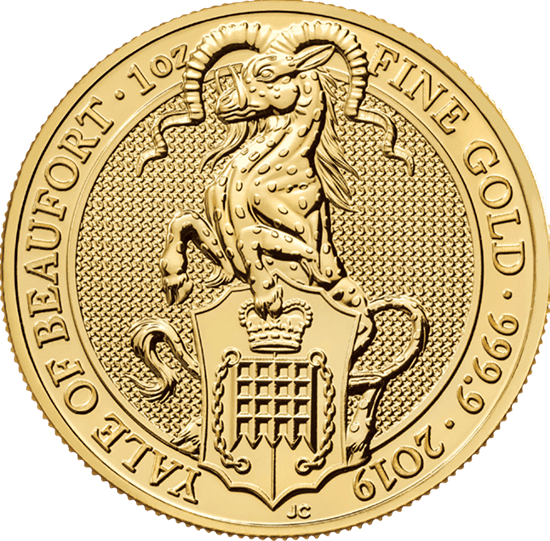 2019 1oz 24k Gold UK Queen's Beast 'The Yale of Beaufort' has been added to your shopping cart!